So many people hate airports. They rush through, focusing only on making their flight. A delay means time wasted and the necessity of being the first to find an outlet for charging ones phone or laptop. Most airports have some sort of art in them. 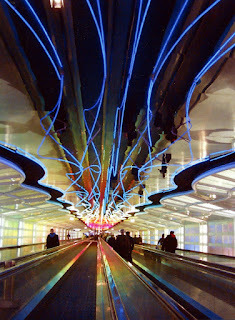 My favorite is the neon tubes and glowing walls surrounding the walkway that connects the B and C concourses at Chicago's O'Hare Airport. Surely I am not the only person who has nearly missed a connecting flight because I was mesmerized by the changing rainbow of lights. 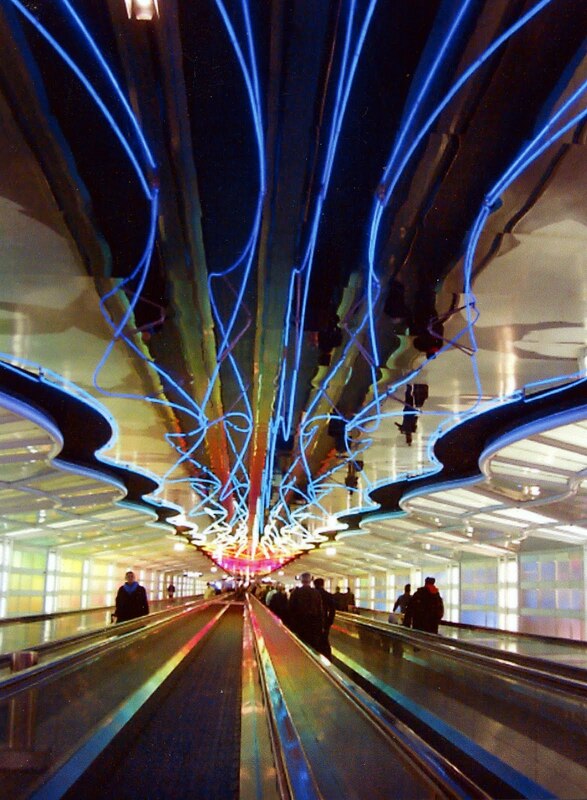 If you have to run along the moving sidewalk, dragging a bag behind you, isn't the race a little happier for taking place while surrounded by yellow-orange-red-green-blue-violet?